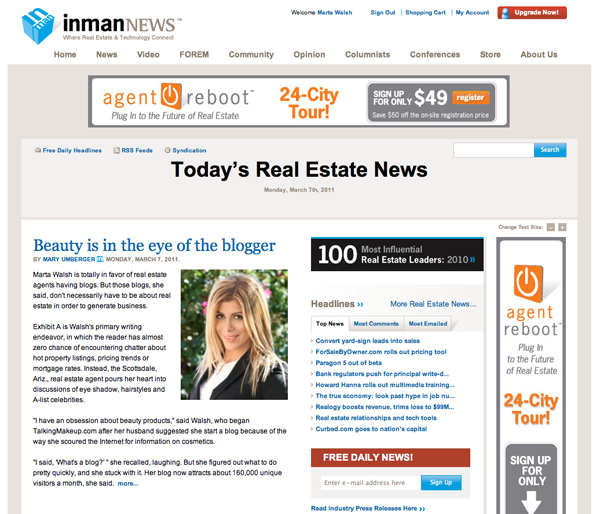 Today I had the honor to feature on the front page of one of my favorite online publications Inman news. I subscribe to their RSS feed for both the main site and their excellent “Future of Real Estate Marketing” blog. Both sites give me idea’s for blog posts and both are great general resources for real estate professionals. For the piece I was interviewed by the delightful Mary Umberger, a freelance journalist who has a long running real estate column in the Chicago Tribune. In addition to the closed deals, the cosmetics blog has generated other leads, she said, including calls from people who are looking for the contact information for her brokerage but call her instead because the makeup blog has come up first in their online search. Walsh also has begun a traditional real estate blog, at MartaWalsh.com. Read the full article at Inman News. It was truly an honor to be featured by a site I already use as a daily resource and some of the comments are very heart warming. Very cool to see Marta in the press for integrating social media with real estate. 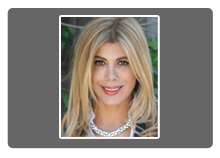 She is definitely one of the only real estate agents in the Arizona valley i know doing a good job blogging. I enjoy following her posts and will have to keep a close eye out for any exciting new real estate posts. Keep up the great work!